My favorite Disney movie...and possibly my favorite movie otherwise...has always been Mary Poppins! Watching it as a child, I fell in love with Mary and Bert's "jolly holiday" outfits and wanted to hang out with them and the dancing penguins! Watching it as an adult, I was shocked to discover all the hidden humor that kids completely miss. There are some great jokes in that movie! A movie made for the whole family to enjoy. 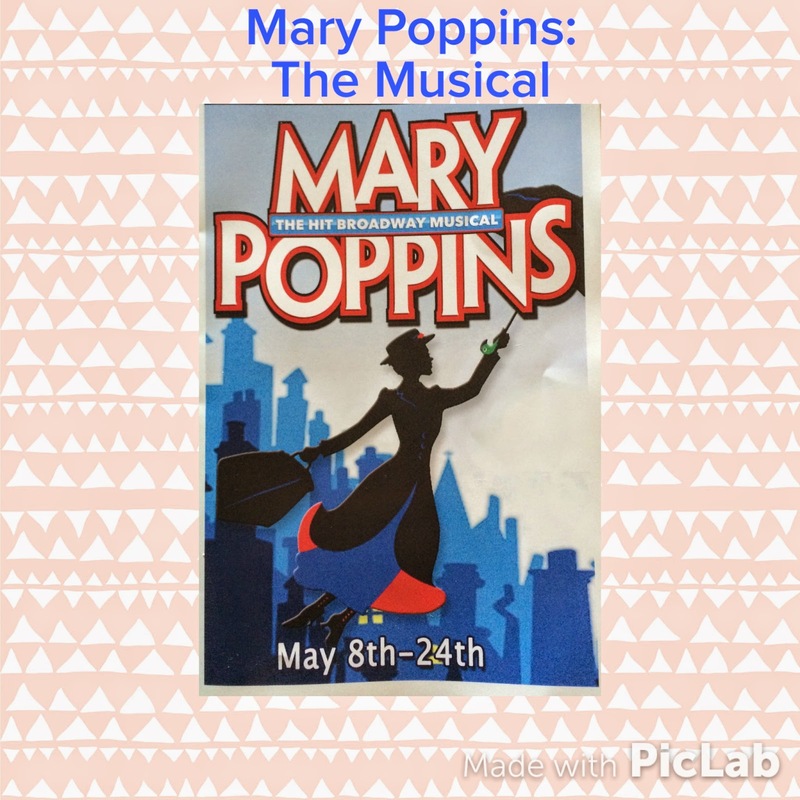 So, obviously, when I saw that the Broadway version of Mary Poppins was coming to my town, I was quick to recruit my Mary Poppins-loving mom to come with me and have an evening of practically-perfect fun! Now, let's be clear, I didn't see this show on Broadway, or even in a major city. And, I'm not typing this to review the performances (which were great), or the theater (which was lovely). More than anything, I wanted to check out how the story compared to my favorite movie. I tried reading the original book by P.L. Travers. Twice. I couldn't get through it either time. Not sure why. I may very well try again. THIS POST CONTAINS SHOW SPOILERS. READ AT YOUR OWN RISK! The show starts out almost identical to the movie. Word-for-word in some sections, which was fun...it's also possible that Disney took these words straight from the book. Who knows? (Not me! I couldn't finish the book...twice!) Katie Nana quits, the kids offer an advertisement for a new nanny, Mary Poppins arrives with the ad in hand, even after Mr. Banks tore it up. Most every song from movie was included. (Notable exceptions being "Sister Suffreagette" and "The Life I Lead"...more on this later.) HOWEVER, these songs are not straight from the movie. Many have the chorus you know and love, with new verses to match the situations in the story. They are also in a differing order than the movie. But it flows for the story being told on stage. There are a lot of changes, some worked and some didn't. There were statues that come to life replacing my beloved dancing penguins. But, I was okay with that. Supercalifragilisticexpialidocious came from going to a store to buy an ounce of conversation, which ended up being letters in a basket put together to make this word...I didn't get that part so much. Maybe it came from one of the Mary Poppins books?? Anyone?? There were, however, some standout moments that were either amazing, or terrifying. Now on to the amazing: Mr. and Mrs. Banks. Remember I said earlier that their songs weren't in the play as they were in the movies? Here's why: Their characters have a much richer story-line in the play (again, possibly from the book...anyone??). Mr. Banks, as he tells it, was raised by the world's most amazing nanny, Miss Andrew. She taught him discipline and raised him to be the strong well-adjusted (ahem...emotionally distant, absent father) he is today. He is focused on a life of precision, order, power, and prestige. When Mary Poppins leaves mid-show (don't worry, she comes back, before her final good-bye at the end), Mrs. Banks finds Miss Andrew to come care for the children and prove to her husband that she can do well finding an appropriate nanny. Mr. Banks realizes that he has had selective memories about Miss Andrews (a *really* fun character), and this sparks the big change of heart that we all know he has at the end. Mrs. Banks story-line is even better! She wants to be a doting mother. She doesn't want a nanny or servants, per se. It's at Mr. Banks insistence that she hires a nanny for her children. Mr. Banks is very concerned with how the he and his wife are seen in the public eye. He wants Mrs. Banks to give up her passions and hobbies to attend charity events and host tea parties with the "right" people. She sings a beautiful song about not knowing how to be the "Mrs. Banks" that he expects. Really fantastic stuff! A side-note on the sets. It's hard to make magic come to life on stage with limited special effects that can be done. There was great use of giant digital screens that helped to bring a little Mary Poppins magic into the theater. 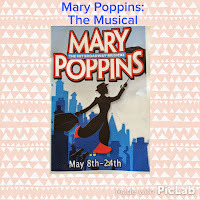 If Mary Poppins ends up in your town, go check it out! You won't be disappointed!